The Immigrant Student Success Center is a welcoming and safe space that helps our students develop emotional wellbeing, a sense of community and belonging, and empowerment. We value and understand the experiences undocumented students bring to the John Jay community and work to help students develop their unique gifts and talents. Information: We share and provide information through our newsletter, social media, and training sessions for staff, students and faculty. Mentoring: We work to connect students with each other to create community, support, and trust. Resources: We refer students to educational, financial, and legal services on and off campus. Advocacy: We increase awareness of immigrant student issues on campus by mediating conversations and advocating for student resources on campus. 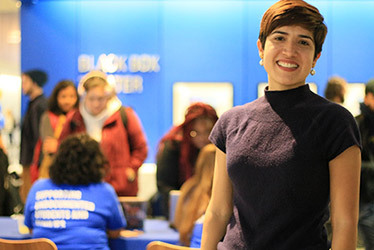 Cynthia Nayeli Carvajal serves as the Immigrant Student Success manager at John Jay College. She is dedicated to supporting student growth and success for undocumented and immigrant students. Originally from Guadalajara, Mexico, she immigrated to the East Los Angeles, CA when she was 5 years old. For the next 14 years of her life she remained in the U.S. as an undocumented immigrant. Upon receiving permanent residency, she went on to attend UCLA and continued her education at Teachers College, Columbia University. She is currently overseeing educational services, programs, and logistics for the inaugural center and working towards her PhD from the University of Arizona. Cynthia hopes to create educational services, networks of support, and action-oriented steps to advocate for undocumented and immigrant students in John Jay College and the greater New York City area.